U14 Team; Winners of the league and Charlie Grant Cup. 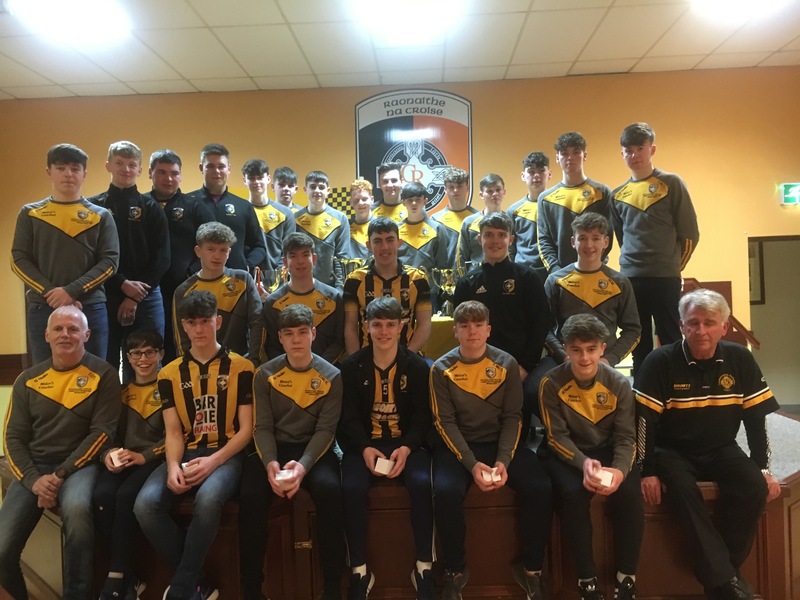 U16 Team; League and Championship Winners. 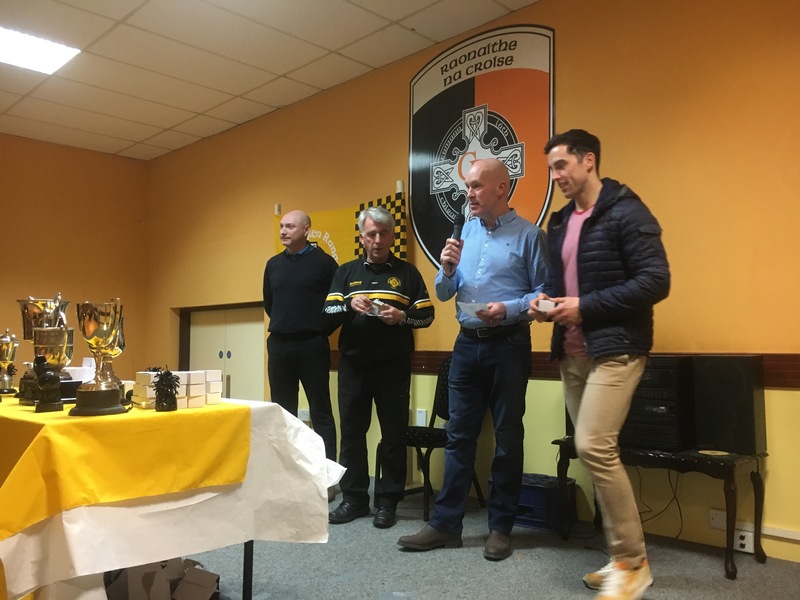 It was a great night and well done to both teams and managements. 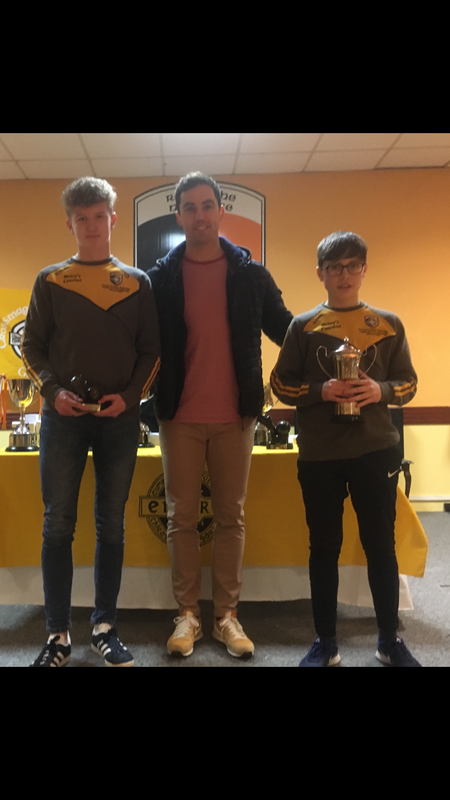 Congratulations to Thomas Og Duffy and Caolan Finnegan , joint winners of The U14 Player of the year award who were presented with the Pat McShane Cup. 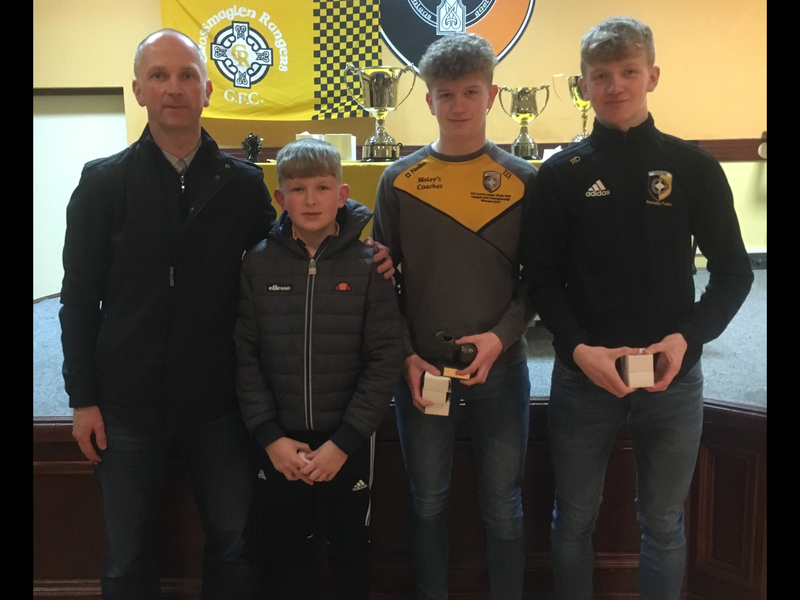 Our U16 joint players of the year were Patsy and Liam Finnegan and they were presented with the Thomas McConville Cup. Well done boys. 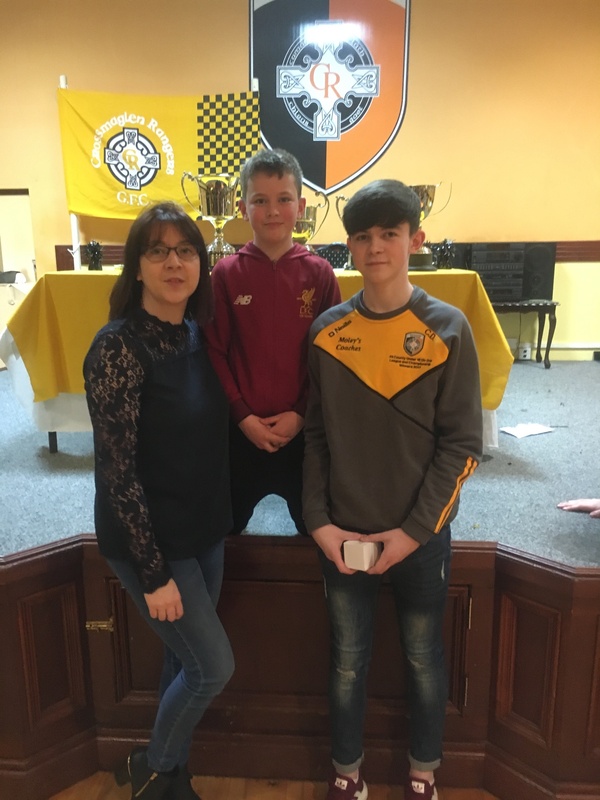 Many thanks to Elena Martin, Armagh Minor Board for attending and for all her assistance throughout the year. 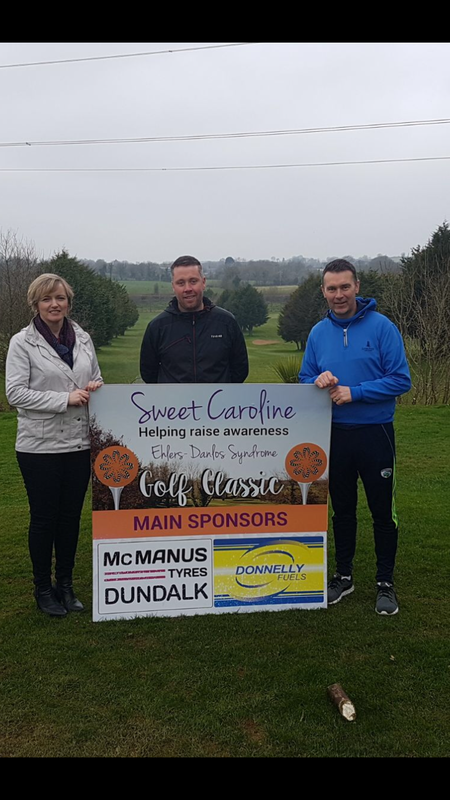 Thanks to sponsors Short Sports, Kevin Murtagh CGP and Moley Coaches. Huge thanks to all the Mothers for the refreshments and to all who attended. Finally, well done and thanks to Tim for organising a fantastic night and for been a superb compère. 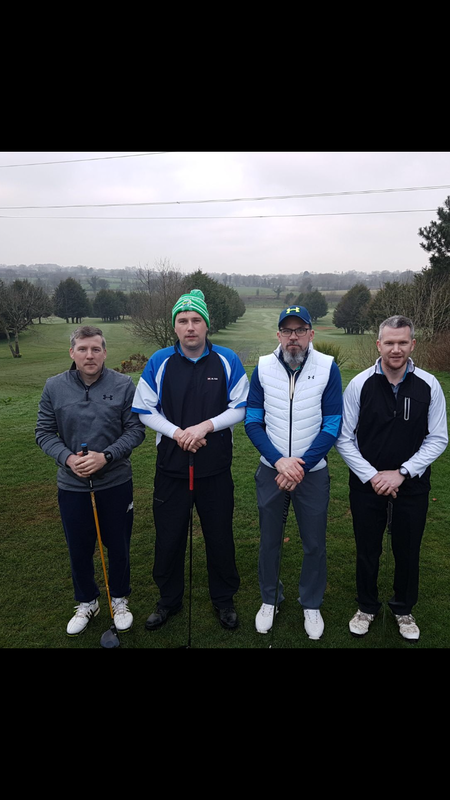 On Sunday afternoon we travelled to a cold and blustery Abbey Park in Armagh to play County Champions, Armagh Harps in the senior football league. We got off to a fantastic start , a free converted by Aaron Kernan followed quickly by our first goal of the match , thanks to Mickey McNamee who reacted quickly to a bad kick out by the Harps goalie and he placed the ball in the back of the net. Harps got off the mark with a point. Points from the O’Neill brothers , Oisín (2) and Rían (2) increased our lead. 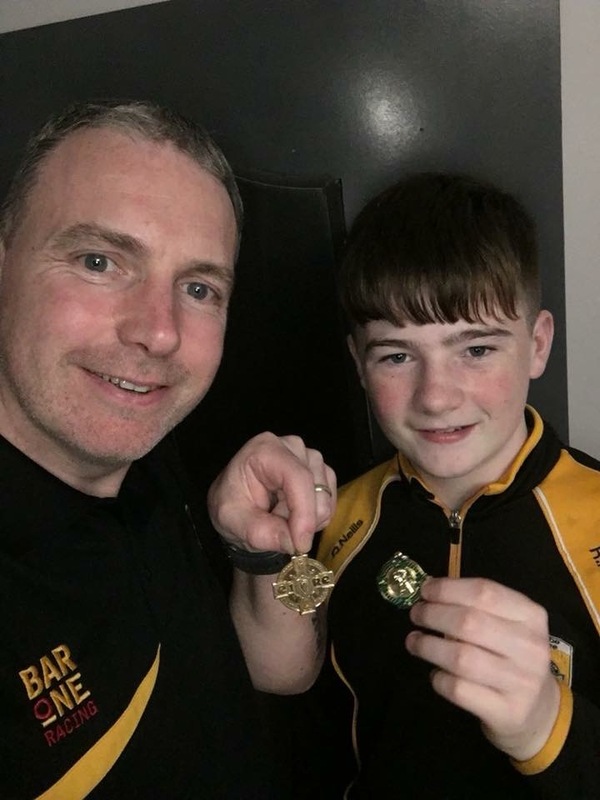 With the game only ten minutes old, Colin O’Connor got our second goal followed by Aaron’s second point of the match.We exchanged a trio of points with Harps, Paudie Stuttard, Rían and Oisín O’Neill the point scorers for us. 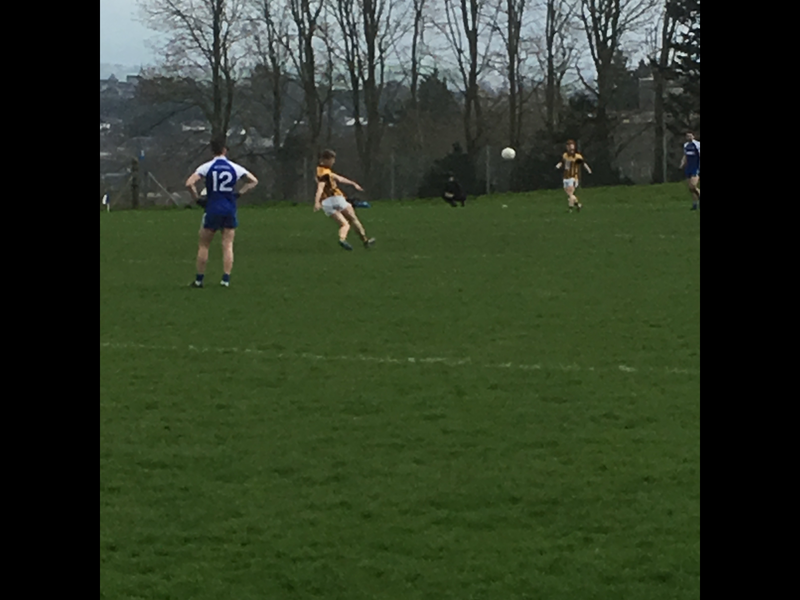 With the game entering the last ten minutes a great pass from Paudie Stuttard to Kyle Carragher resulted in our third goal of the match. Harps responded with a goal and point to reduce the deficit but we finished the half with points from Rían and Paudie to leave us in a commanding position at half time. Rian O’Neill opened the scoring in the second half with a point. 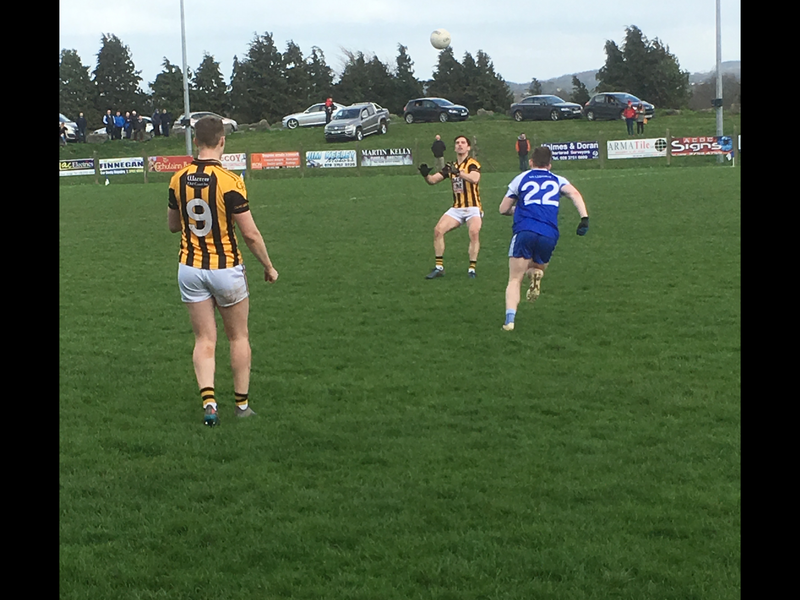 Kyle scored a point before Harps got a trio of points (2,F). We pushed on with points from Rían (2) and Paudie (2) and midfielder Stephen Morris. Harps registered two more points before Mickey Mc got his second goal of the day just as the game hit the 60th minute. 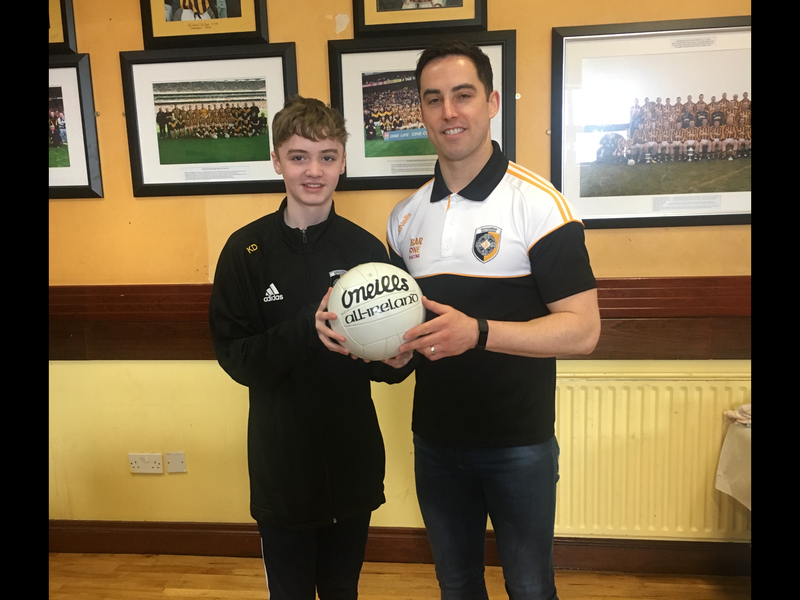 The ball for today’s Senior league fixture was sponsored by Donnelly fuels, Concession Rd. 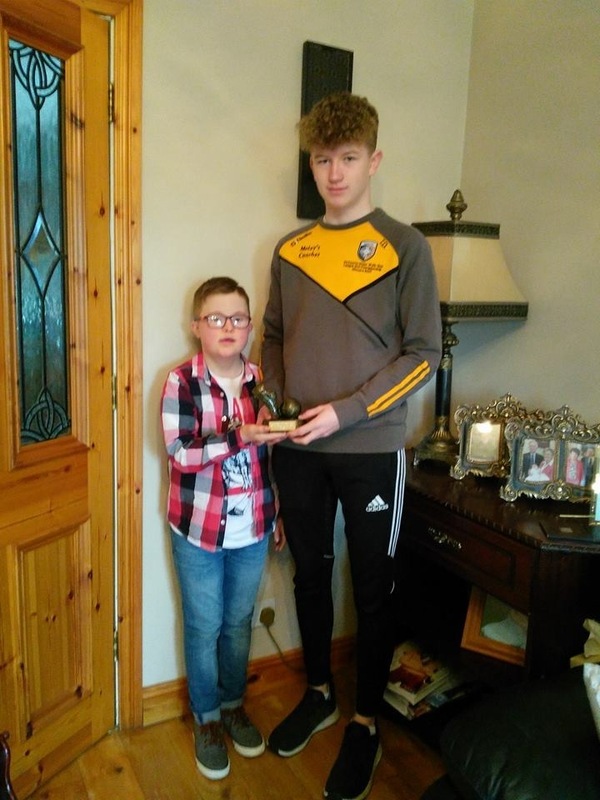 Thank you very much Kieran, Johanne and family for your sponsorship and support for our senior team. 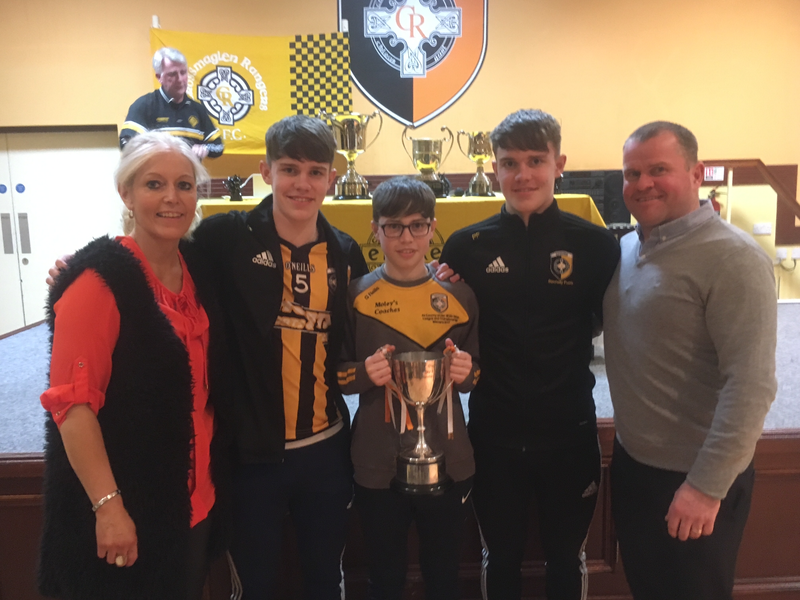 The entire Crossmaglen Rangers Club send their very best wishes to Kathleen Kelly & family. Thankfully Kathleen has improved and we continue to keep her in our thoughts and prayers in the days ahead. 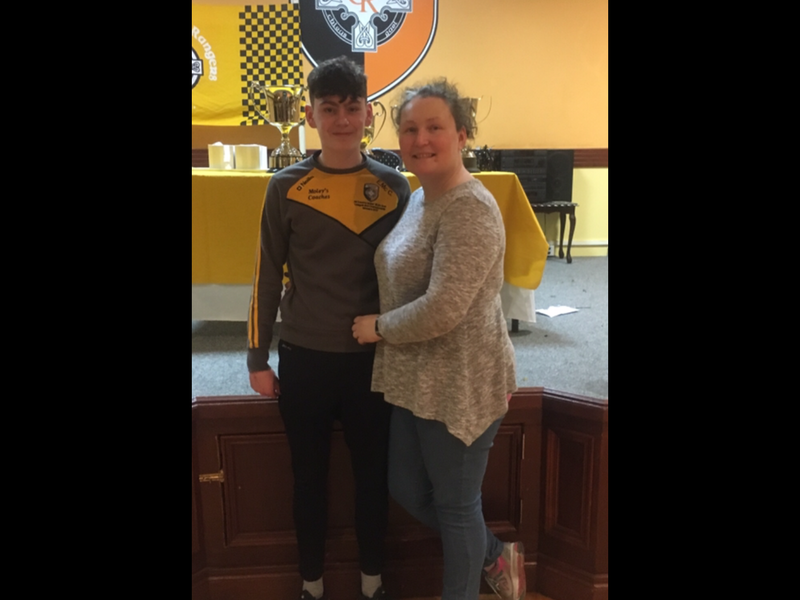 The Kelly and Aherne families wish to express their sincere thanks to all who attended the church to recite the rosary and pray for Kathleen over the past three days, it was a marvellous example of community spirit. 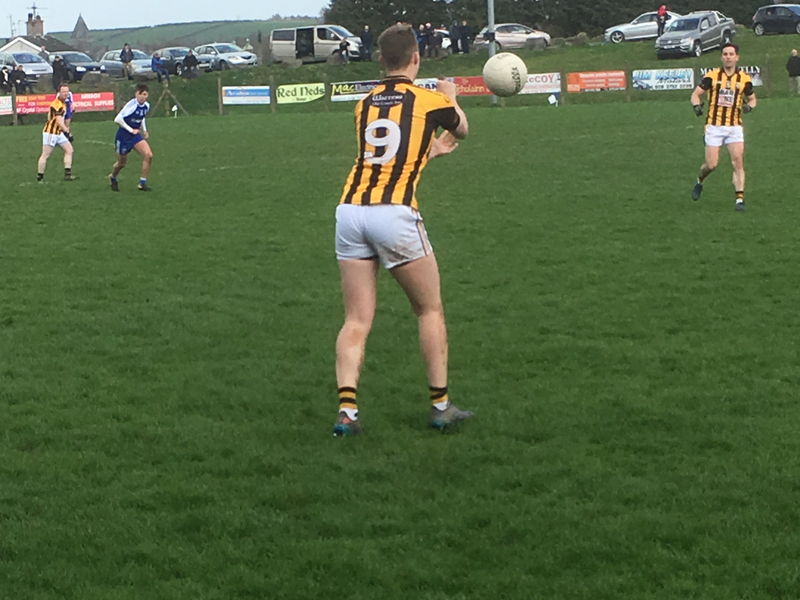 Silverbridge V Cross, Monday 16th April in Silverbridge. Cross V Clan Éireann, Thursday 19th April in Cross. Cross V St Patrick’s , Sunday 22nd April @2.00pm in Cross. Anyone who hasn’t registered won’t be eligible to participate in the upcoming season. 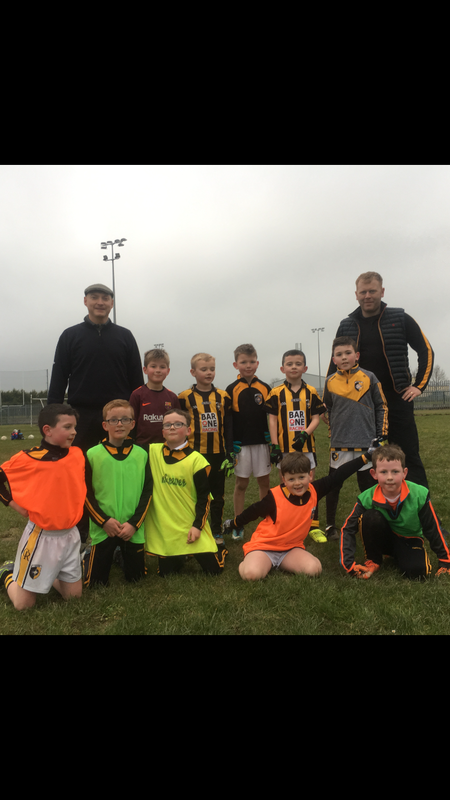 U8 training commenced on Friday night. Well done to all the boys and girls who participated, you were all brilliant. 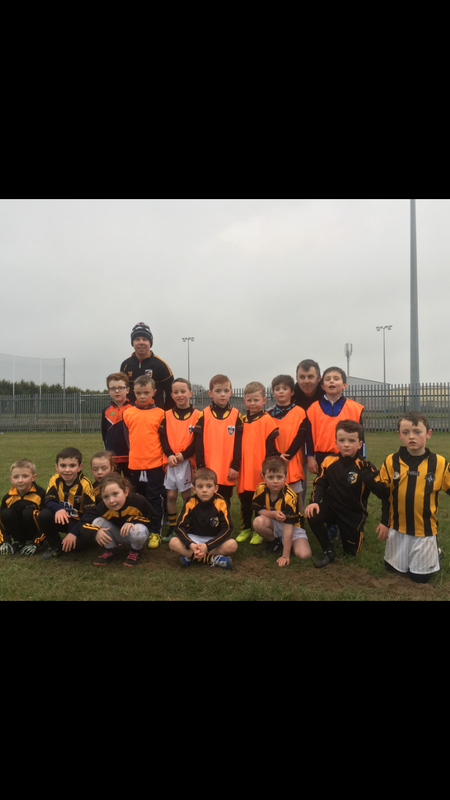 U6 training will start next Friday, 20th April at 6.30pm in the council field. 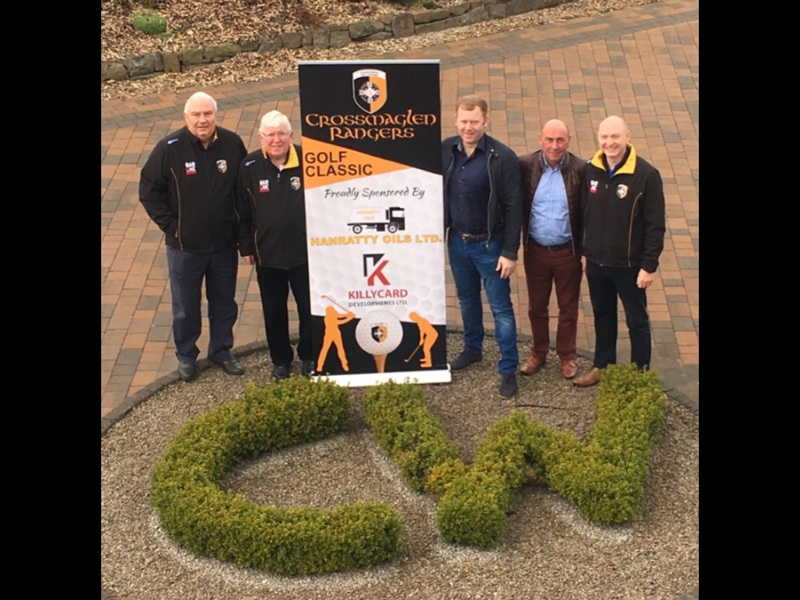 Don’t forget to tell family and friends that our Golf Classic will take place in Concra Wood Golf Club, Castleblayney on Friday 6th July. 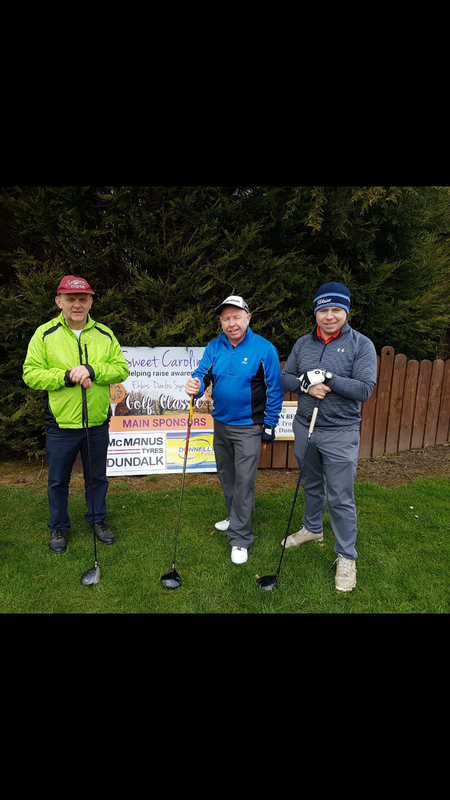 A great days golf took place on Saturday in Ashfield Golf Course, Cullyhanna. 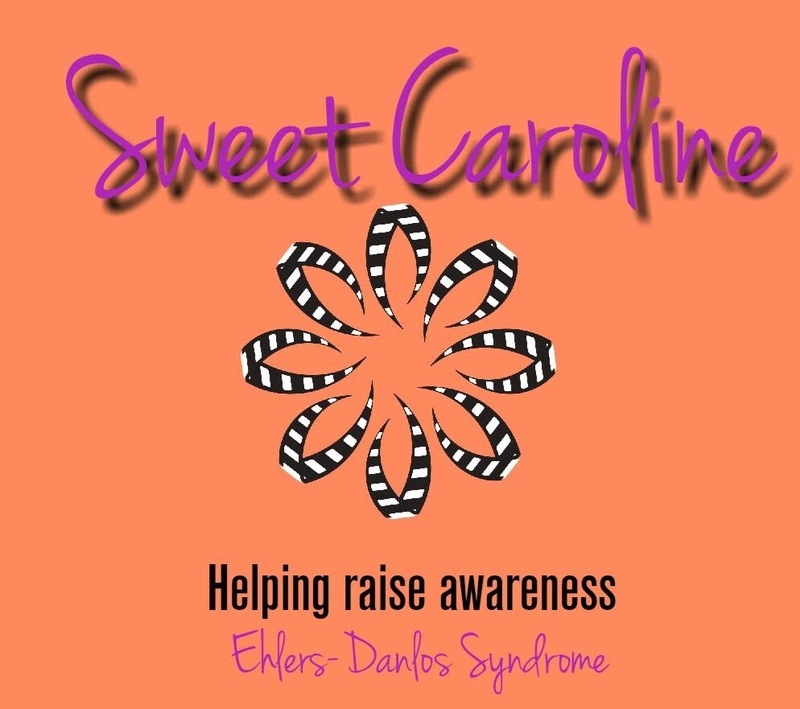 All proceeds from the Classic will go to the Sweet Caroline Trust which is helping to raise awareness of Ehlers-Danlos Syndrome. Irish Classes, Tuesday evening, 7.00-8.00pm in St Patrick’s Primary School. 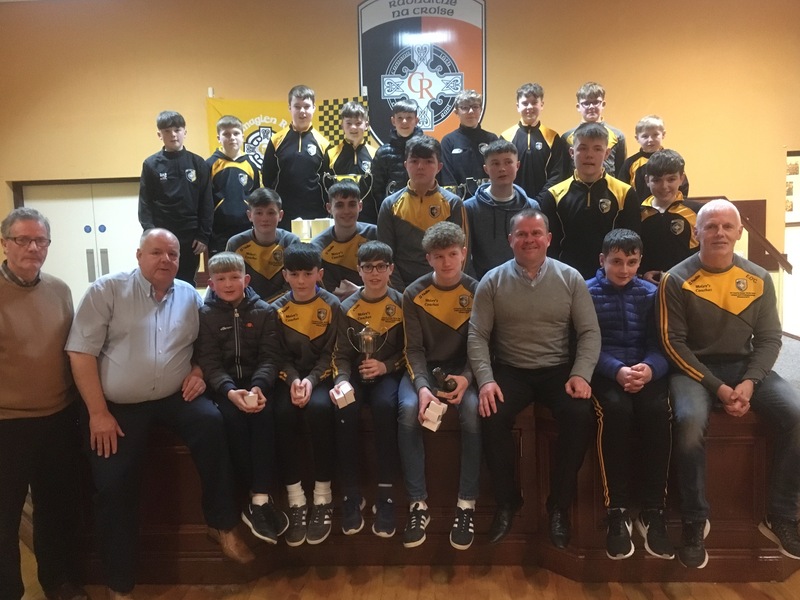 We are both delighted and honoured that the cyclists will stop briefly at the Rangers Hall on Sunday 29th April at 4.00pm (approx) on route to Newry. At least six cyclists from the area, some club members, are participating in the cycle. 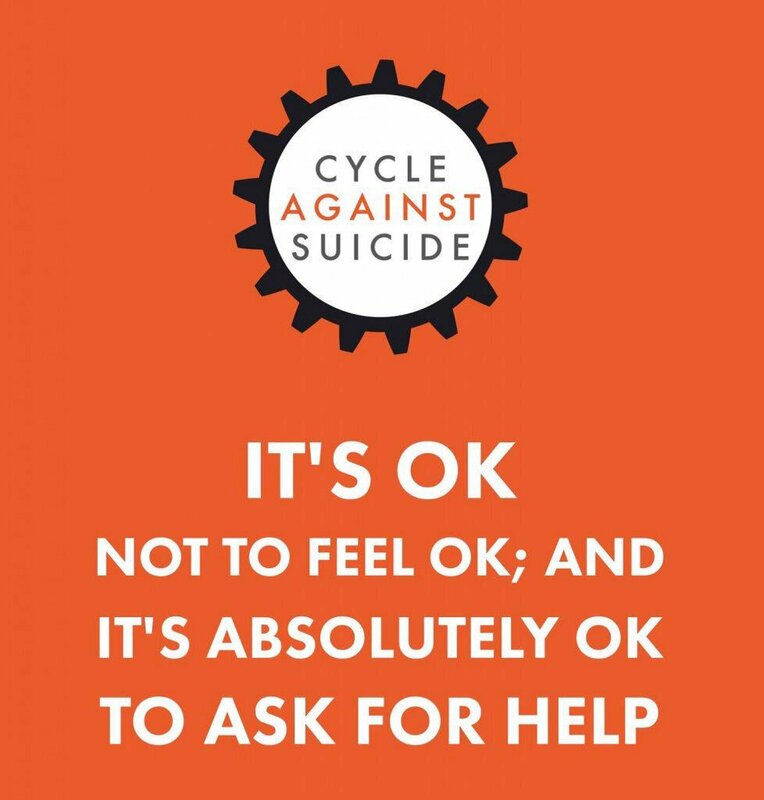 Cycle against suicide is now in its fifth year. This fantastic event helps to bring awareness of all the support that is available for anyone who may be battling depression, self harm, at risk of suicide or has been bereaved by suicide. It is a great honour for the club that the cyclists are stopping with us. So keep the 29th April free so we can give the cyclists a good Crossmaglen Rangers welcome. 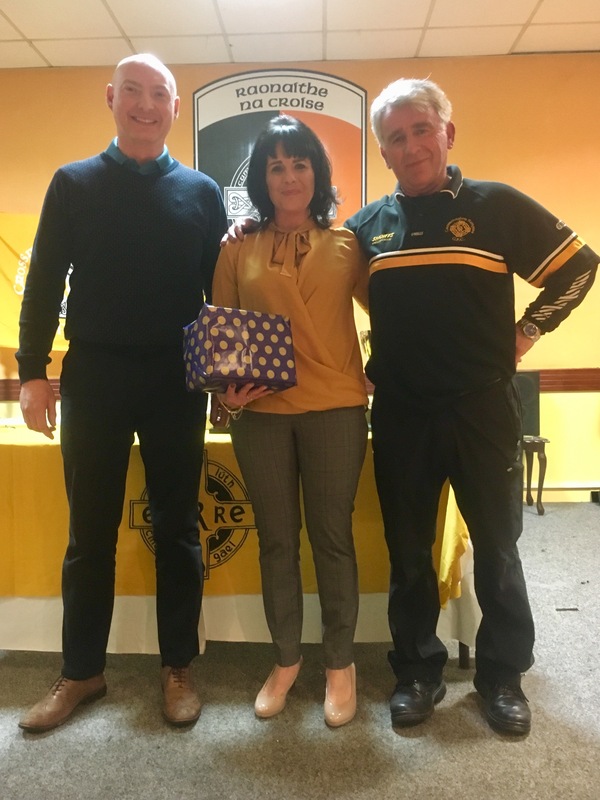 Many thanks to Mccreesh Foods LTD ( Fintan) for their sponsorship at our recent Big Breakfast. This is a very important message for all our gym users. Gym membership is now due. You must be a fully paid up member to use the gym. Excellent value for the use of a fantastic facility. 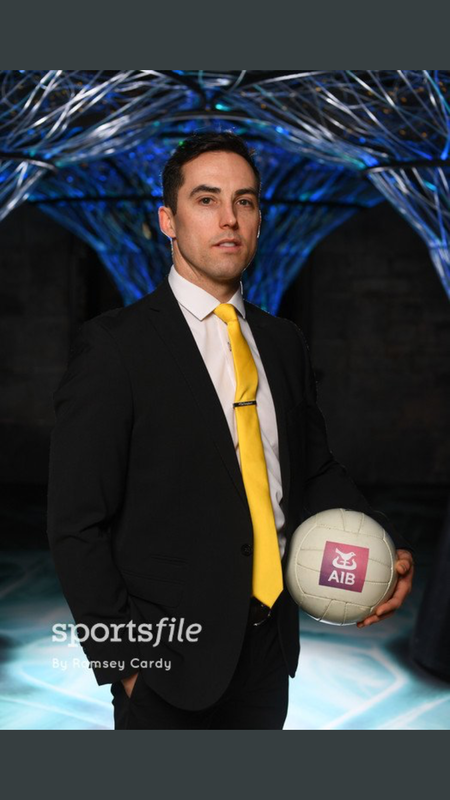 Pic Below; Aaron Kernan at the launch of the AIB GAA All star Club Awards. G4G 2018 Programme: Yippee! The time has come, our G4G programme kicks off this week! The weather forecast is not looking great for Monday night, so we are going to take no chances. 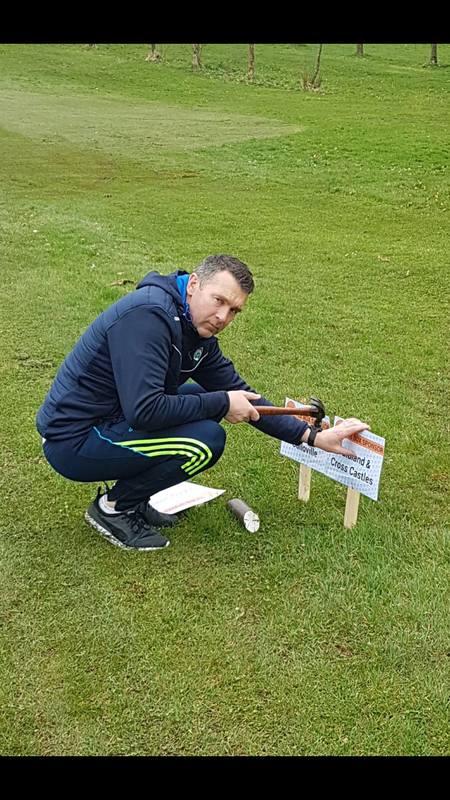 The first week of the programme will run in St. Oliver Plunketts’ Youth Club, a big thank you in advance to them for the use of their facilities. 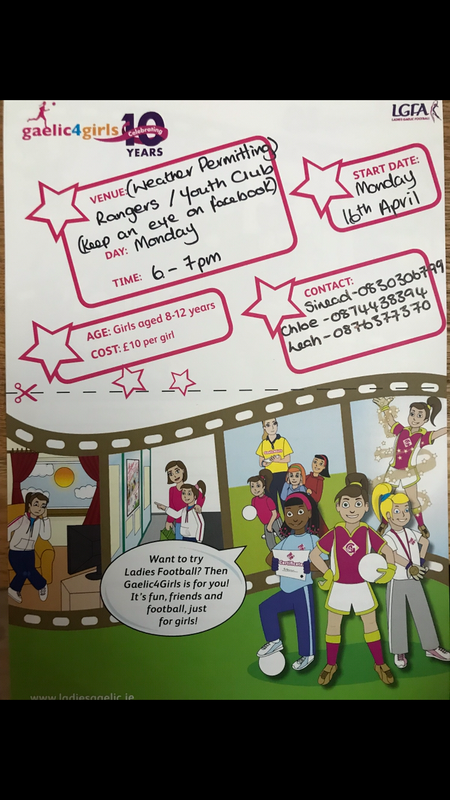 We are looking forward to seeing all of our young Rangers get involved, as it aims to introduce young girls to gaelic football, but teaching newbies the basics, while also encouraging more experienced players to lead and take part in the Ladies game. 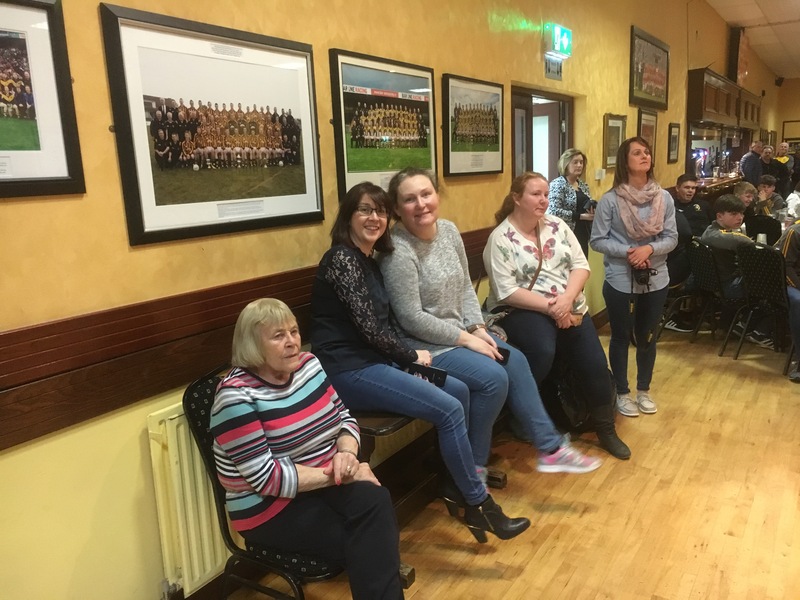 The cost of the programme is £10 per child, which covers the cost of the gaelic4girls jersey, which all girls receive at the end of the programme. Its that time of the year again, and we need all old players to renew their membership. The cost of registration is £30 for adult members and £20 for the underage player. Registration forms have been given out by team managers, and must be returned with monies to Marion on Elaine. The deadline for registrations is April 30th, all players must be fully paid by this date in order to train or play any match with the club. 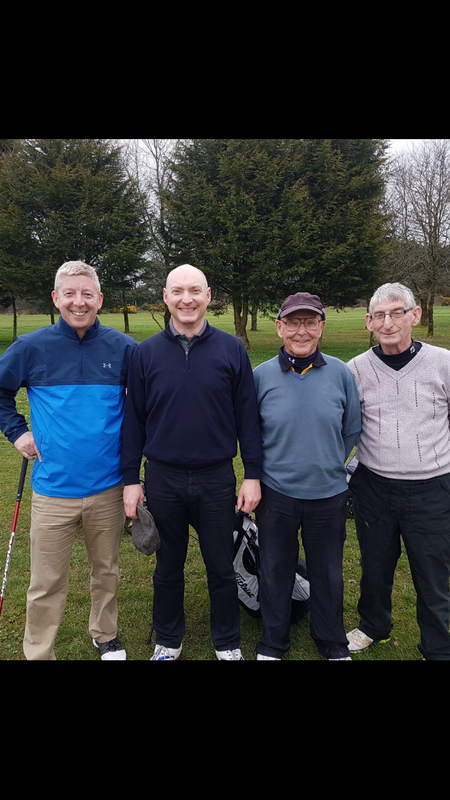 The seniors met Forkhill in the next round of the league on Saturday evening, they were leading with about five minutes to go, when Forkhill got a penalty which brought them Level, and unfortunately followed this up with two easy points. This meant our girls were beaten, by two points at the final whistle. Hard luck girls and good luck with this weeks games. 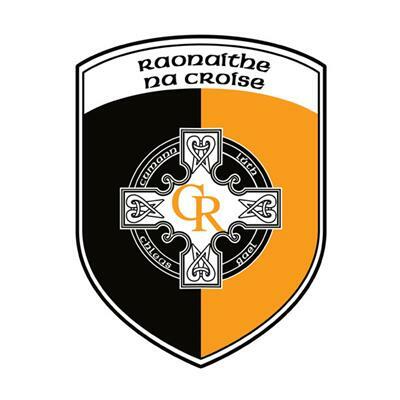 Senior & Minor squads continue to train on Tuesday evening, Peter and Maria will be in touch by message about venue. All old and new faces are welcome, just get in touch with Maria or Peter. The U16 girls were out again this week, and keen to meet Middletown after being narrowly beaten by them last year. Unfortunately this meeting was not to be theirs either, as the final score was 2-09 to 2-05, to Middletown. There’s no games scheduled for this week, but Frank and Paul will be in touch about training and other arrangements. 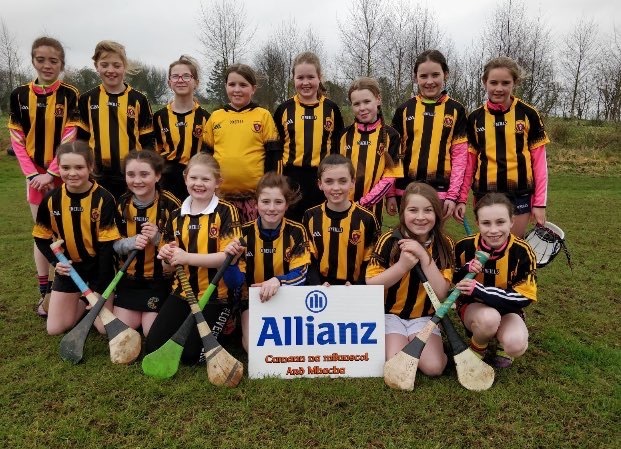 Pic Below; Girls from St Patrick’s School who recently attended the Armagh GAA mBunscol blitz in Middletown. A reminder for all who have an appointment with Action Cancer Big Bus. The bus will visit the Rangers Hall on Wednesday 2nd May. Congratulations to Mickey McNamee and Niamh Carragher on the birth of their wee girl, Eve. 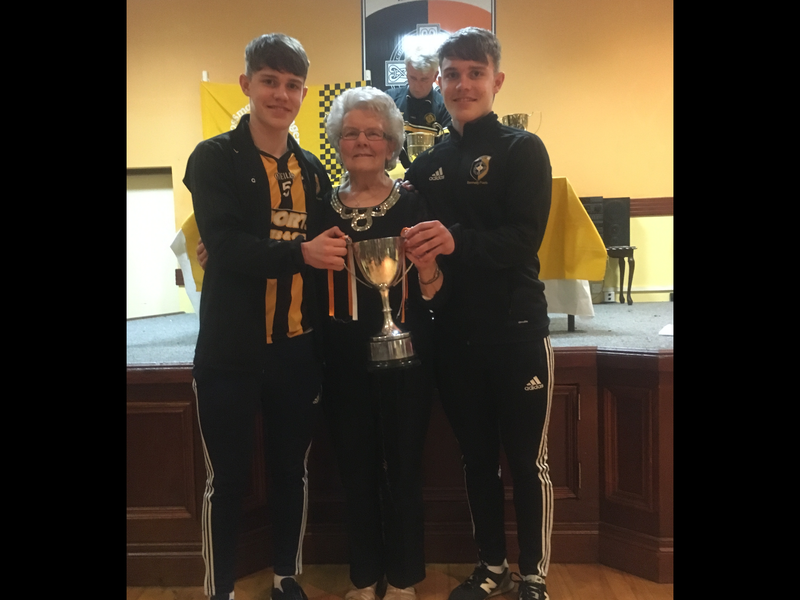 Crossmaglen Rangers GFC send their deepest condolences to Sally McEntee, Margaret McKenna, Patsy Maguire and the extended family circle on the sad passing of their Mother Sarah. 2 matched 3 numbers; Michelle Murchan, Silverbridge & Josephine Murray, Blayney Rd win £50 each. Well done girls. Posted: April 15th, 2018 under Club News.